Here at Away With It, we have been providing waste removal services in Rainham RM13 for a number of years, and over that time have established a reputation for our punctual, professional and affordable service. With a portfolio of waste removal services ranging from small-scale residential waste removal to large-scale commercial rubbish clearance projects, we have the tools and experience for all your Rainham RM13 waste removal needs. Our same day, 7 day a week service operates from 7am to 11:30pm, and as we book in two-hour slots you’ll never be left waiting around. We will give you a complimentary, no obligation estimate before we arrive, and as you only pay for the space you actually fill in our vehicle, we can guarantee a fair price for jobs of all shapes and sizes. We are fully regulated, licensed and insured – 80% of all the waste we collect is either reused or recycled, and we are fully covered in the unlikely event of an accident on site. We sweep, tidy and hoover before we leave, and will do 100% of the hard work and heavy lifting. You never have to lift a finger! Speak to us about our fast and reliable waste removal services in Rainham RM13 today! The name Rainham first appears in the Domesday Book of 1086 as ‘Raineham’, which is thought to mean ‘homestead of a man named Regna’. Traditionally an agricultural settlement, Rainham’s proximity to the River Thames facilitated a great deal of trade with London, and for a time in the 16th and 17th centuries boat building was a thriving industry in the area. The Thames also allowed for the Murex Iron Founders to move into the area in 1917, and they eventually became part of the British Oxygen Company. Other industries that have thrived in Rainham over the years include brickmaking and, after World War II, gravel extraction. In the early 20th century, Rainham began to be swallowed up by Greater London, and the estates were broken up and sold to housing developers. Despite technically occupying the Metropolitan Green Belt, Rainham was excluded and as a result it exists today as a thriving residential and industrial community. 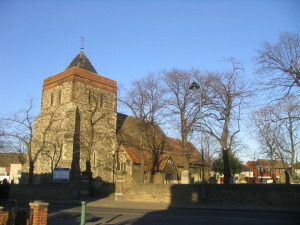 Notable people with ties to Rainham and the surrounding area include musician Ian Dury, who lived in the area as a child, singers Frankie Sandford and Jessie J and boxer Frank Bruno. https://www.havering.gov.uk/Pages/index.aspx – Your local council website. http://www.joncruddas.org.uk/ – John Cruddas, your local Member of Parliament. http://www.romfordrecorder.co.uk/home – local newspaper, covering news and current affairs in Rainham and the surrounding area.